Singapore has always heavily emphasised human capital. Our basic philosophy is to maximise our people's potential and abilities. We help each citizen to improve himself or herself, and we share the benefits of progress widely among all. In this way, we have vastly improved the lives of all Singaporeans. At independence in 1965, Singapore's standards of housing, public health, literacy and economic development were abysmal. Barely half of each cohort of children went beyond primary school education. Many Singaporeans lived in slums and villages. Sanitation was poor, we had regular outbreaks of cholera and tuberculosis was prevalent. The post-war baby boom and population explosion put great pressure on public services. In the early 1960s, Kandang Kerbau Hospital in Singapore was delivering more babies than any other maternity hospital in the world. The Government desperately needed to get the situation under control. We launched a crash programme of public housing, building tens of thousands of HDB (Housing Board) flats yearly. We built schools all over the island, and operated morning and afternoon sessions to make double use of the infrastructure. We launched a family planning programme, and improved maternal and child health, with inoculation and school milk programmes. By the 1970s, we had achieved a new baseline for everyone, and could take the next step to raise education and healthcare standards further. Although by then nearly every child went to school, education outcomes were poor. Dropout rates were high. Students were promoted from level to level, whether or not they passed. Singapore's national healthcare spending as a percentage of GDP, which is lower than most developed countries. Some left school practically illiterate, speaking none of the official languages, and unprepared for the job market. The SAF (Singapore Armed Forces) even had to organise special "Hokkien platoons" to manage and train national servicemen who spoke only Hokkien. Initially, students studied in four different language streams. Gradually, we brought the English, Chinese, Malay and Tamil schools into one national school system. English became the common medium of instruction, with the mother tongue taught as a second language. Our job is never done, because there will be new levels to reach, and higher expectations to fulfil. But we can be proud of what we have achieved. 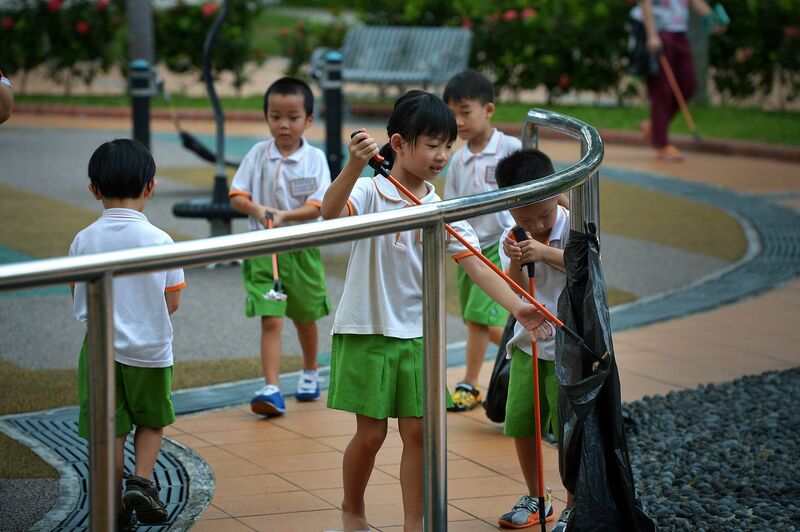 Our goal is to improve the lives of all Singaporeans. By investing in our people, we have enabled citizens to take charge of their lives, think about their future and decide what they want for their children. This is the way for us to progress together. Starting around 1980, we embarked on major education reform. The architect was Dr Goh Keng Swee, previously the minister for defence. He brought in system engineers from Mindef (Ministry of Defence) to overhaul the whole education system. He introduced ability-based streaming, and improved the curriculum to strengthen basic language, mathematics and science education. The "Singapore method" for teaching mathematics, much admired today, was introduced in 1983. We expanded post-secondary education, investing heavily in polytechnics and vocational institutes, both the campuses and the courses. The aim was to equip students with practical knowledge and skills that would help them find productive, well-paid jobs. We thus avoided the high graduate unemployment experienced by countries which had hugely expanded university education without regard to job opportunities. These reforms lasted us for about 10 to 15 years. But by the 1990s, it became evident that the school system had become over-centralised, rigid and lacked specialisation. Hence, we embarked on a second phase of reforms. First, we created diverse pathways for students to progress through the education system. We introduced a Normal (Technical) stream in secondary schools for those suited to less academically oriented, more technical education. This enabled most students to complete secondary education, and go on to post-secondary, applied-oriented education. We also encouraged schools to develop their own identities and niche specialities such as sports, arts or robotics. We created specialised schools - the NUS High School of Mathematics and Science, the School of Science and Technology, the Singapore Sports School, the School of the Arts and, for students who have difficulty with the mainstream curriculum, NorthLight School and Assumption Pathway School. Second, we upgraded the teaching profession. We raised salaries significantly to match what a good graduate could earn in the private sector. This enabled us to hire teachers from among the better graduates of every school-leaving cohort. We invested in the professional training of educators at different stages of their careers, and created different career tracks for education officers: a leadership track for heads of departments and school leaders, a specialist track for subject area and curriculum design specialists, and a teaching track for those with a gift and passion for teaching. Third, we improved oversight while empowering educators. We grouped schools into clusters, each headed by an experienced cluster superintendent. We promoted talented school leaders fast, to create a cadre of young, dynamic school principals, and gave them the resources and the authority to make decisions. For example, schools could hire extra staff, fund enrichment programmes or subsidise study trips, and distinguish themselves with different strengths and focus areas. Our slogan is "every school is a good school". It does not mean all schools are identical, or have the same student profiles. But each school provides its students with a good education, and each gets good teachers and the resources to be good in its own way. Similarly, with healthcare, the slum clearance and extensive public housing programme in the early years enabled us to achieve a basic standard of public health. After this, we focused on raising quality while ensuring financial sustainability. The Government provided extensive healthcare subsidies, but healthcare was never free. In fact, one of the first things the People's Action Party Government did when it was first elected in 1959 was to charge a small token for prescriptions to discourage wastage. We paid attention to both the demand and supply sides of healthcare. On the demand side, we kept the basic principle of personal responsibility to complement state funding. We sought to avoid the pitfalls of a purely tax-based or insurance-based system, free at point of use, like in Britain or the United States. We introduced compulsory personal health savings (MediSave) that could be used for inpatient treatment in 1984. Later, we introduced catastrophic medical insurance (MediShield Life) and long-term disability insurance (CareShield Life), with premiums paid out of MediSave balances. We also created MediFund, a safety net to help patients who despite these schemes still had difficulty paying their medical bills. On the supply side, we reorganised government hospitals to improve financial discipline without becoming profit-driven. Hospitals used to be government departments, oblivious of their operating costs. We converted them into "restructured hospitals": autonomous, not-for-profit entities, still owned by the Government, but required to balance their budgets. Private hospitals exist, but with the public sector serving three in four inpatients, the Government maintains strong influence over the sector. In recent years, we have enhanced step-down care, especially by building community hospitals, for patients who need to stay longer in hospital but do not need high-tech, tertiary care. Our primary care network includes government polyclinics across the island, and private general practitioner clinics which see a large proportion of outpatient cases. The Community Health Assist Scheme (Chas) now subsidises outpatient care by private GPs, especially for chronic illnesses like diabetes and hypertension. Currently, our infant mortality rate is 2.2 per 1,000 live births, and life expectancy is 80.9 years for men and 85.5 years for women, among the best in the world. Our national healthcare spending is 4.6 per cent of GDP, lower than most developed countries. Our combination of public and private medical care has delivered good health outcomes at affordable cost. The World Bank has ranked Singapore No. 1 in their Human Capital Index, but we have not arrived. We must continue updating our policies to support the changing needs of the economy and the aspirations of our people. For education, this includes starting earlier in life, improving pre-school and making it more affordable, to bring all children to a more equal starting point. We need to moderate examination pressures and excessive competitiveness in schools, emphasising character, values and soft skills like teamwork, critical thinking and cross-cultural appreciation. We are investing in lifelong learning, and building an attitude of personal responsibility so that we keep reskilling throughout our working lives. For healthcare, one challenge is to keep medical costs affordable as medical science progresses, with new and expensive treatments and personalised medicine. Another is to manage lifestyle-related diseases like diabetes and heart disease. We also have to cope with a rapidly ageing population, which will need more healthcare services - hospitals and nursing homes - and manpower. Lee Hsien Loong is the Prime Minister of Singapore. This article is adapted from his remarks at the Human Capital Summit Dialogue in Bali on Thursday.